A Mass of Christian Burial for Marilyn Keyser Williams will be at 11 a.m. Thursday, June 7 at the Minor Basilica of the Immaculate Conception where she received the sacraments of Baptism, Holy Communion, Confirmation and Matrimony, and continued to attend regular Mass up until April 29. The Rev. Blake Deshautelle will serve as celebrant, and concelebrants are the Rev. John Hill Cunningham and the Rev. John O’Brien. Interment will be in Memory Lawn Cemetery under direction of Blanchard St. Denis Funeral Home following the service. The family will receive friends at the funeral home chapel from 5 – 8 p.m. Wednesday, June 6 with recitation of the Holy Rosary at 7:30 p.m.
Mrs. Williams, 95, died at the Natchitoches Regional Medical Center, Louisiana Extended Care Hospital, in Natchitoches following a short illness. She was preceded in death by her husband of 48 years, Ragan Stacy Williams Sr.; and by parents, Paul McLean Keyser and Mathilde Aurora (Mattie May) Hill Keyser, all of Natchitoches; and one brother, Paul Hill Keyser. Family was her lifeblood and she enjoyed many picnics, swimming and fishing, and family gatherings along the beautiful Cane River with her many descendants as well as nieces, nephews and cousins. She is survived by her three children, Mary Williams White (Richard) of Natchitoches, Ragan Stacy Williams Jr. (Cynthia) of Shreveport and John Pollard Williams (Karen) of Whitehouse, Texas; six grandchildren, Jennifer Mims Roquemore (Romulus) of Natchitoches, James F. Mims Jr. (Shelley) of Natchitoches, Lauren Williams Bertsch (Bill) of Denver, Colo., Ragan S. Williams III (Allison) of Raleigh, N.C., Jessica Williams Stenklyft (Anthony) of Spring, Texas, and Martiel Williams Drinkard (Joshua) of Quitman, Ark. ; 24 great-grandchildren, the Roquemore Family, Courtney, Brittany, Kayla, John, Matthew, Catherine, Hannah, Jacob and Madelyn; the Mims Family, Marilyn, Camille, Jace Carpenter, Christian Carpenter and Kennedi Carpenter; the Bertsch Family, Jack, George and Anna Kate; the Williams Family, Sawyer and Julie Gray; the Stenklyft Family, Margaret, Emily and Anthony Jr.; and the Drinkard Family, Paul and Mabel; and three great-great grandchildren, Courley, Chanler and Remi. In addition, she welcomed into her family grandchildren through marriage, Amanda Spoto (Tony) of Dacula, Ga, and Brian White (Samantha) of Atlanta, Ga.; and four additional grandchildren, Annabelle, Madelynn, Addison and Lily. She also had two nephews, Paul Jr. and Joe Keyser; and two nieces, Dolly Dowden and Cheryl Henningan; but her sister-in-law, Mary Poleman Keyser, remains her closest family and friend. Marilyn was a native and lifelong resident of Natchitoches. She was a 1939 graduate of St. Mary’s School and was active in the Orchestra and the Drum and Bugle Corps. She attended Northwestern State College (Normal) but was called to work in the Peoples Bank by her uncle as the men left their post to fight in World War II. She was active as a Military Maid and traveled to Ft. Polk with the Red Cross to entertain the troops during wartime. She met her husband while working at the Peoples Bank after the war, and after a brief time to raise three children to school age, returned to The Peoples Bank rising to Assistant Vice President and Cashier. Mrs. Williams was active in many organizations in Natchitoches, including, but not limited to the Catholic Daughter Regina Pacis Court #1372 for 68 years. 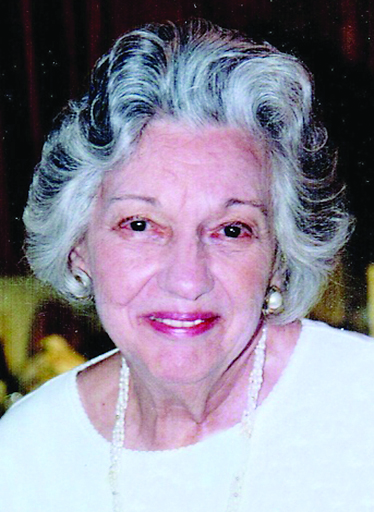 She was a charter member of the Natchitoches Northwestern Symphony Society, APHN, the Service League of Natchitoches and the American Legion Auxiliary. In addition, she served as a past president and treasurer of Chapter AP, PEO, and was active in the Geronimo Book Club. Also, she prayed with the ladies of the Thursday Rosary Group since its inception. Pallbearers will be James (Jay) Mims Jr., Ragan S. Williams III, Romulus Roquemore, Bill Bertsch, Anthony Stenklyft, Bill Dowden and Mickey Hennigan. Honorary pallbearers are Paul Keyser Jr., Joe Keyser and Joshua W. Drinkard. The family would like to express their sincere appreciation to the many family members and friends who visited, sent cards and prayers during Marilyn’s short illness; and are especially grateful to the physicians, nursing staff and caregivers who so patiently saw after her needs, especially Alvin Young, Mae Wilson, Jewel Phillip, Brenda Williams, Tiffany Stewart and Darlene Hardy. In lieu of flowers, the family suggests memorials be made to St. Mary’s School, 1101 E. Fifth Street, Natchitoches, LA 71457; or Minor Basilica Immaculate Conception, 145 Church Street, Natchitoches, LA 71457.